So my first long tour for almost a year has started! Originally planned as a tour from Berlin to Viersen, but shortened as Claudia didn’t feel confident tackling that distance, Klaus had organised a route taking us through some interesting cities in NL (Nijmegen, ‘s Hertogenbosch, Boxmeeer and Roermond) but our first night would be in Germany, in Xanten. This tour would be six days and would cover 400km in total. Because Claudia doesn’t have a Velomobile (she uses my old Trice Q) we would all be on trikes for this tour. Unfortunately the weather forecast for the six days got steadily worse as the Tour approached and it seemed very likely we would get quite wet. Oh well; I love cycle touring, even in the rain. At 9am they arrived at my door having cycled the 20km from Viersen. 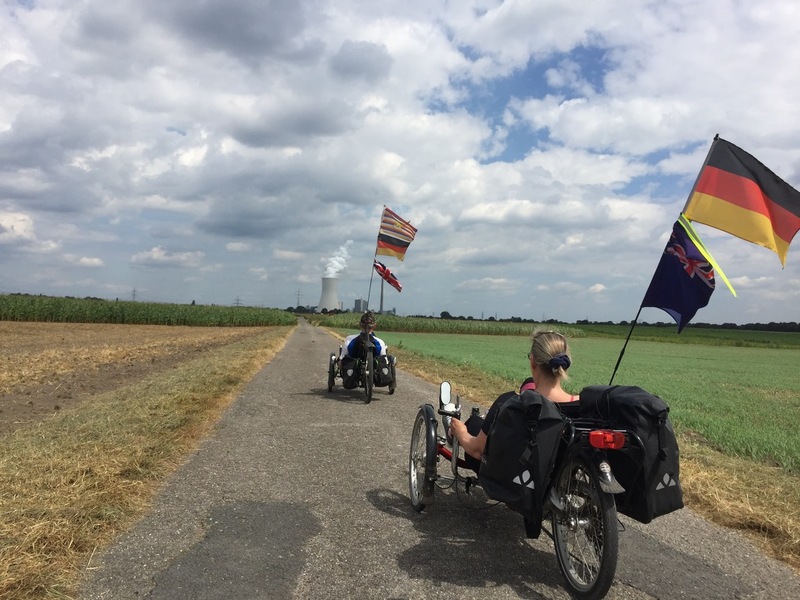 After a quick loo stop we set off, a trio of trikes with various flags (I have Great Britain and Germany, Claudia has Germany and the Union Flag and Klaus has the Kurpfalz flag (where he hails from) as well as Germany and the British flag. Of course they only have the British flag in deference to me, and are too polite to remove them I think! 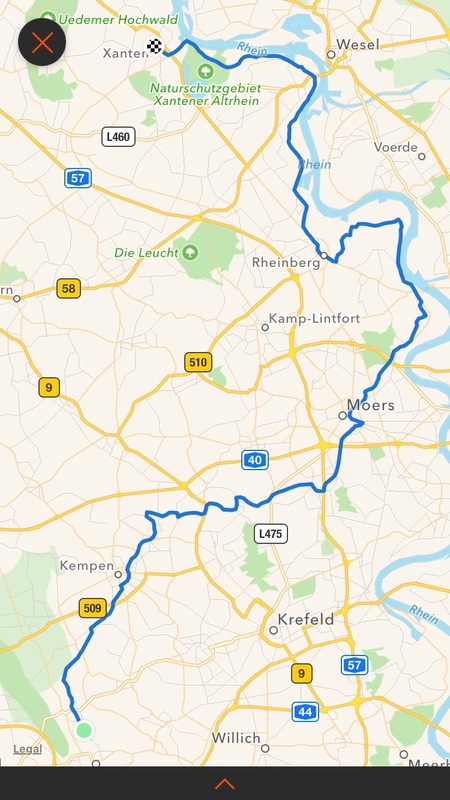 My Garmin doesn’t communicate with my iPad so I can’t upload the tracks until I am at home but fortunately Klaus’s Garmin Edge 1000 talks to his phone and so he has uploaded the track to Strava and here it is (he rode further of course as he started in Viersen). 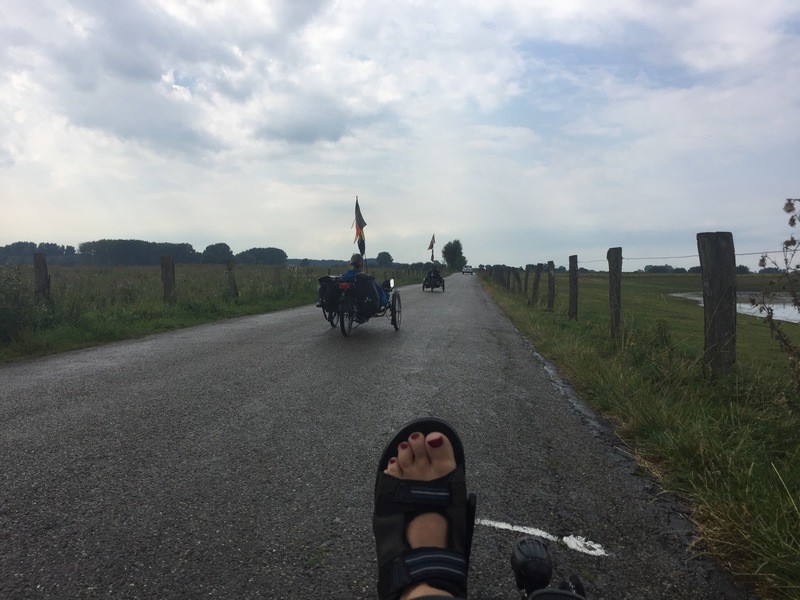 The start of the tour was heading to Moers, a route I have regularly cycled recently in the Velomobile. We arrived in Moers at about 11:30am which seemed rather like cake time so we stopped at a bakery. I had a walnut pastry and a cup of tea and we sat and watched the world go by. Suitably fortified we set off again, leaving the rather off-road track we had been using (a former railway converted into a cycle path) and heading out on quiet roads. 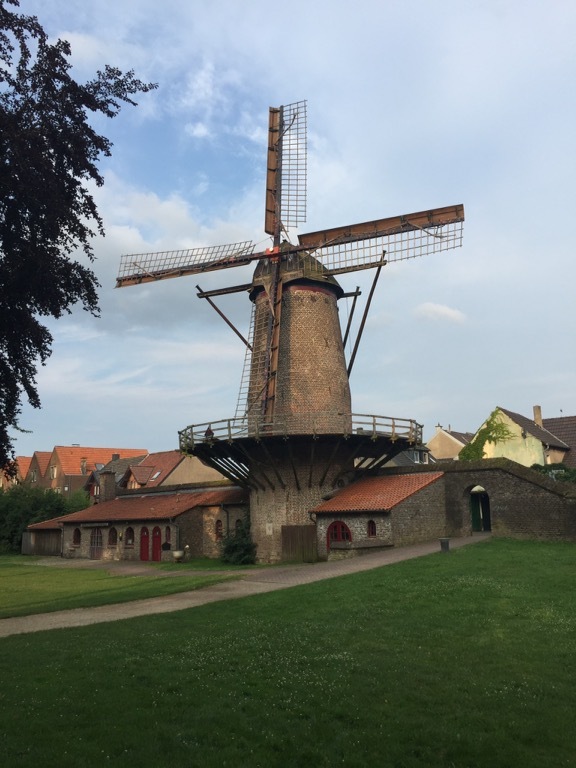 Klaus’s plan was for us not to ride directly to Xanten but to join the Rhein at Rheinberg and then follow it along to Xanten. We approached the Rhein at Orsay which has this rather large power station. We were then cycling along the Deich (dyke) which is the flood protection for the Rhein. The cycle path isn’t on the top of the dyke but lower down so we actually didn’t really see the Rhein much at all, but the large chimneys that show its continuing industrial importance were often visible to our right as we headed north. We spotted a lot of what seemed like milestones but they didn’t seem to be heading to anywhere specific with the distances and in fact we saw lots of different ones around the 10 or 15 mark whilst riding today. 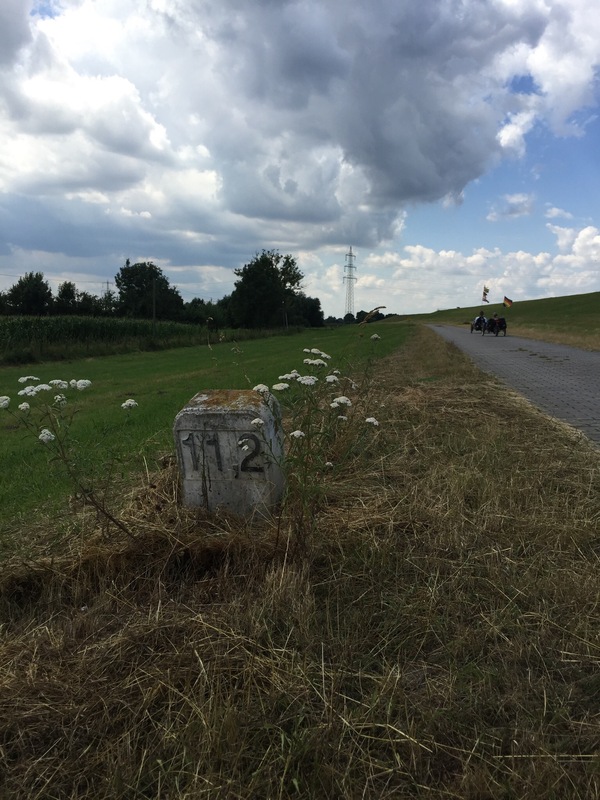 This one was not 11.2km from Rheinberg or from Duisburg so I am none the wiser. 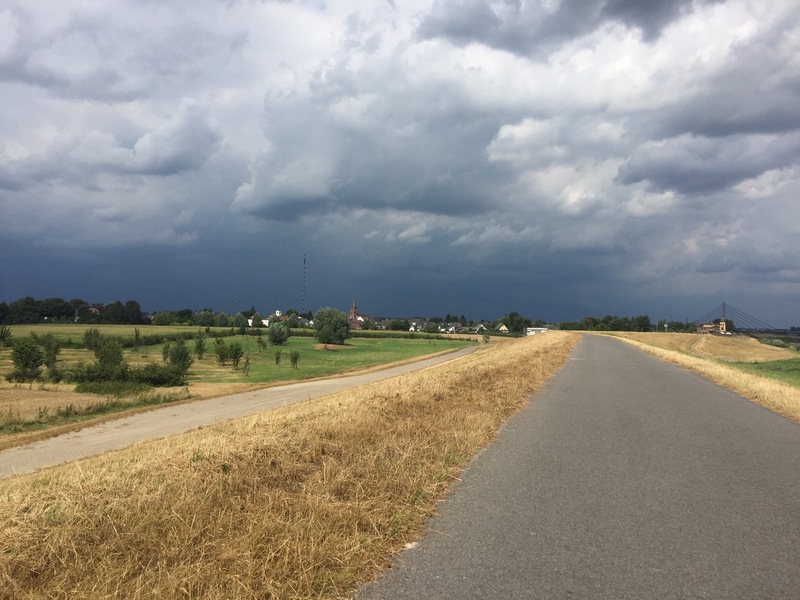 The weather had forecasted rain in Xanten at 14:00 and this looked increasingly likely as we spotted some ominous clouds on the horizon. Here we are approaching Wesel (the Wesel bridge is visible to the right of the photograph), finally riding on the top of the Deich so we could see the river. The wind was a pretty strong westerly which you notice on the trikes but the sun had been out a fair bit so we were relatively warm – normal cycling jerseys kept us warm enough, no coat required. 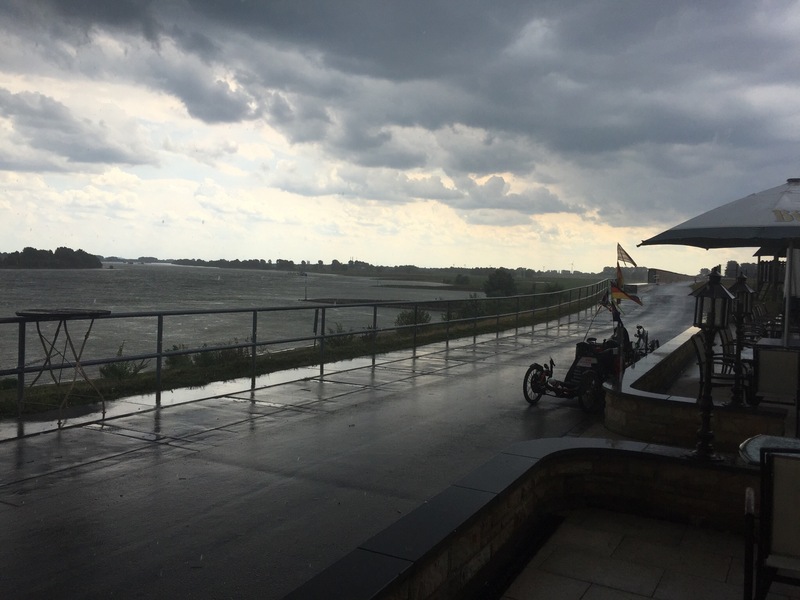 We hadn’t eaten except the pastry in Moers so when we reached a nice Rhein Terrace we decided to stop for some food, particularly because it looked like the rain was on its way. I wheeled my trike onto the terrace under some shelter but the lady told me not to park there. We were the only guests, there was a vast amount of room, but that’s German customer service for you. So the trikes were left out at the mercy of the rain that was surely coming. We sat at a table and Mrs Sour Waitress told us that there was no hot food, only cake. As we had all had cake in Moers we didn’t want anything sweet so just settled for tea or coffee. My cup of hot water was in a really small coffee cup, really just one mouthful, but I didn’t have to pay for it which was a small consolation! Whilst we sat and drank our hot drinks the heavens opened. Claudia felt inclined to stay there until the rain completely stopped but I reckoned that would be a couple of hours so encouraged us to carry on. So we put on our waterproof jackets and sat on our wet seats and set off in the rain. I rather wished I had Penelope with me! 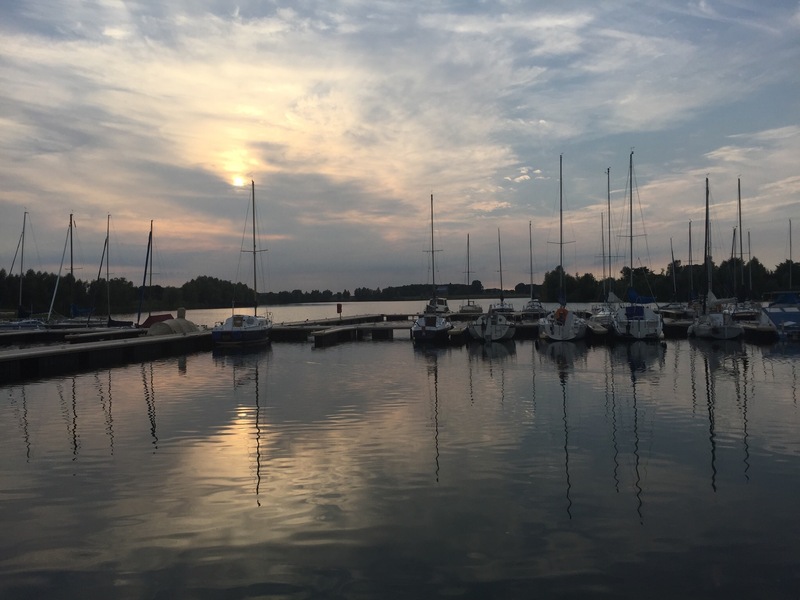 Our route was along the Bislicher Insel where I cycled with the Trike Treffen people at Christi Himmelfahrt. 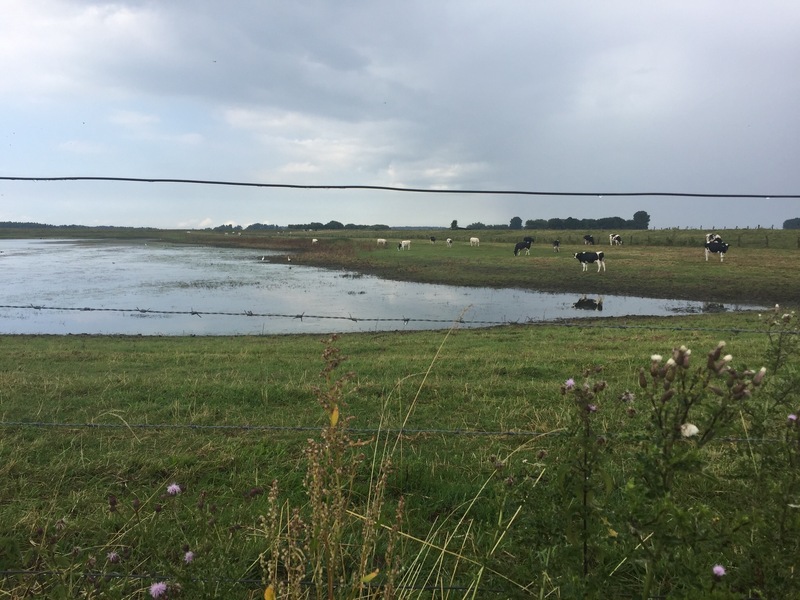 At this small lake we saw, standing in a row, a heron, a stork and a white heron. I don’t think they’re clear enough to see in this photo though. The rain was falling reasonably heavily so we were wet but fortunately it was still warm so not too bad. 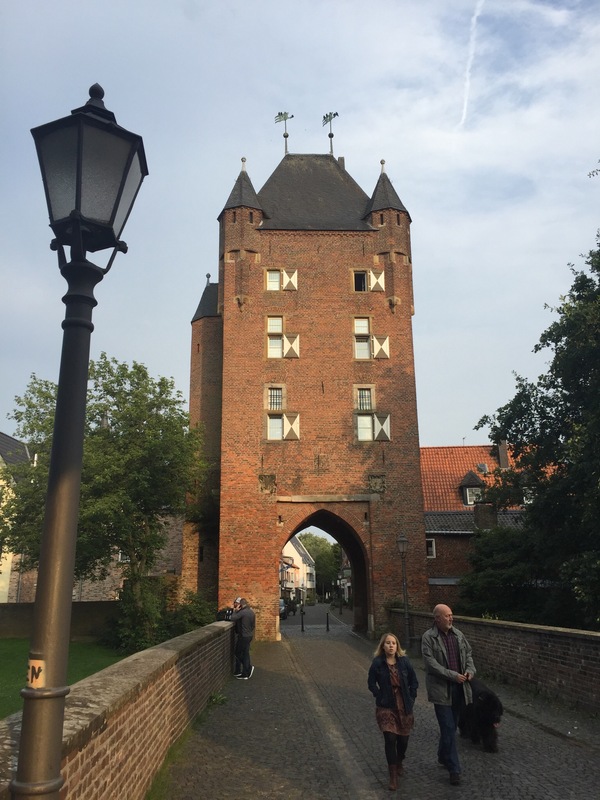 We arrived in Xanten just after four in the afternoon and found our way to our Bed & Breakfast which was built into the walls of the city and very nicely appointed. After a shower and washing our clothes to dry on the heated towel rail in the bathrooms we met at 6 o’clock to find some dinner, first going to the Cathedral for a look around but unfortunately it was closed as a service was taking place. 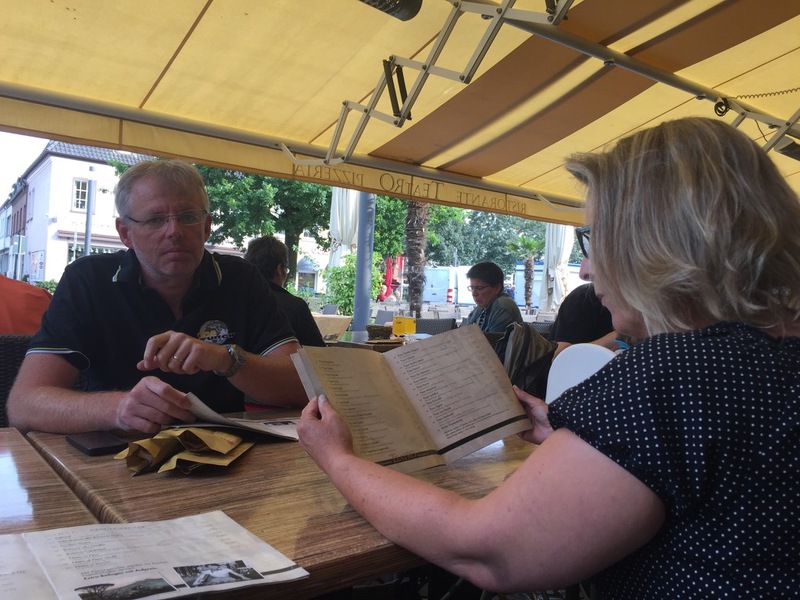 We ended up at an Italian restaurant in the main pedestrian centre of Xanten. 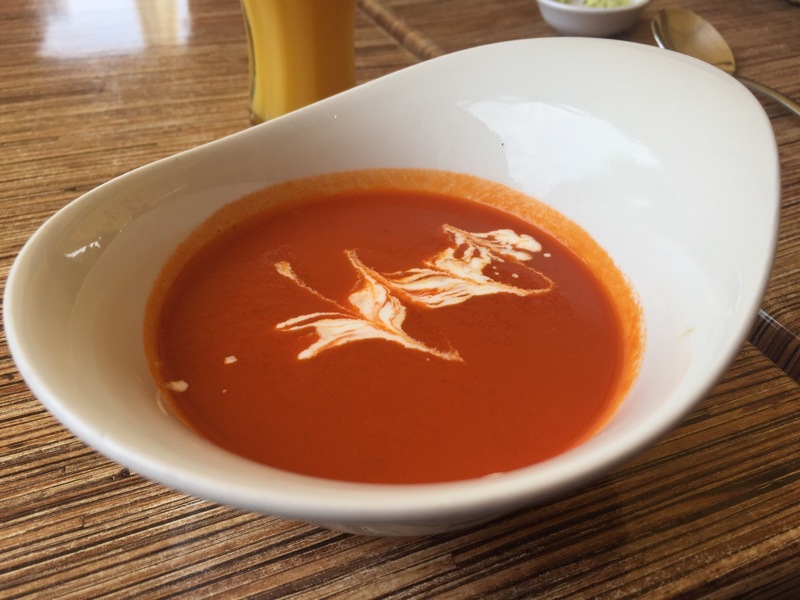 We all had tomato soup to start. 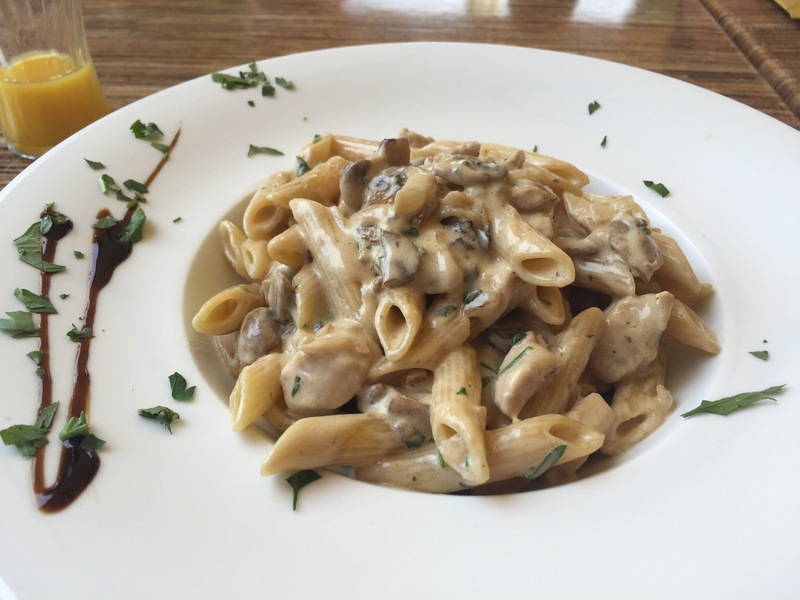 And then I had this tasty pasta meal with turkey and mushrooms. 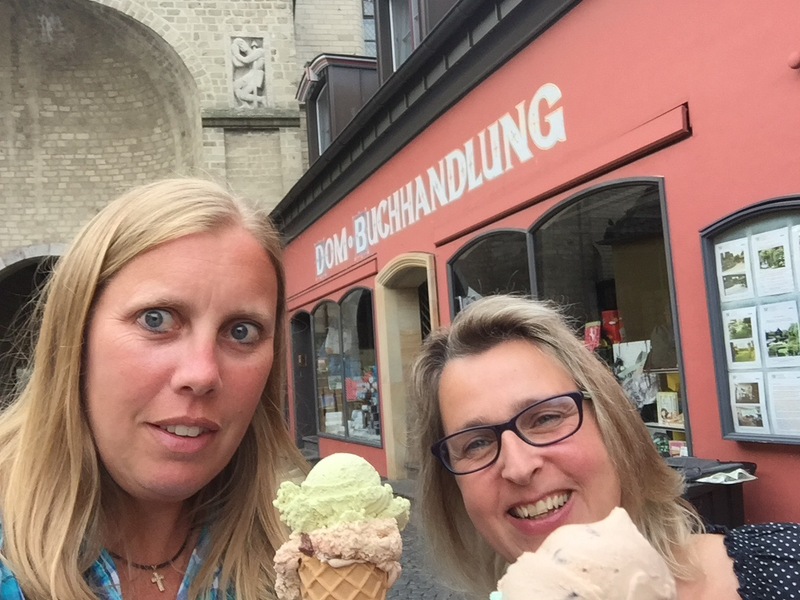 After a very leisurely meal we left the restaurant and found our way to an ice cream parlour. As it was only eight in the evening we decided to go for a little walk. I had seen some signs to a Hafen (Marina) so we followed those, going first through this tower. And then past the large Roman Museum just outside the town wall of Xanten. 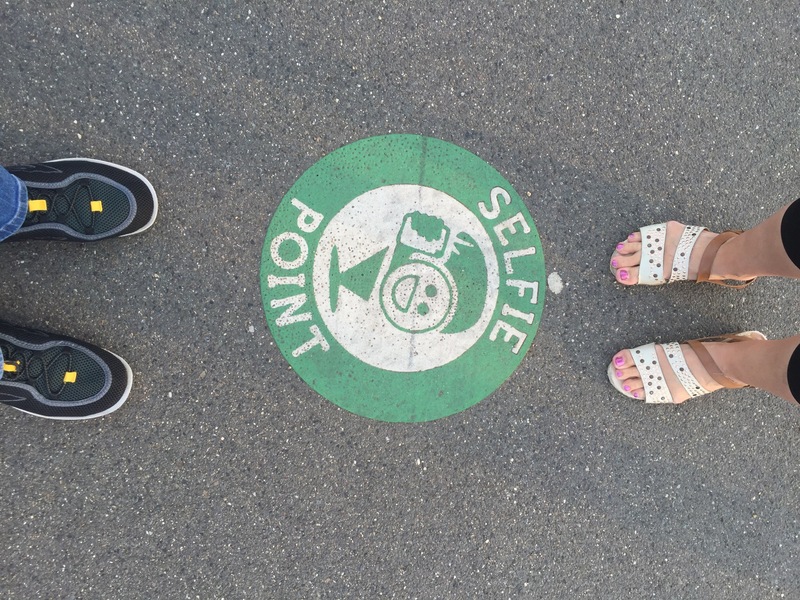 There was a ‘Selfie Point’ where you could photograph yourself outside the museum. I photographed mine and Claudia’s feet! I had a closer look at the boats in the harbour. Then it was time to walk back. On the way back Klaus regaled us with the story of Siegfried (who has something to do with Xanten) which was considerably lubricated by his two glasses of wine with dinner. The moral of the story seemed to be that everyone was stupid, and be careful of women from Iceland. Or something. Xanten is a lovely place and very quiet as cars aren’t allowed in the centre, although the crows were making a racket as the sun was setting. 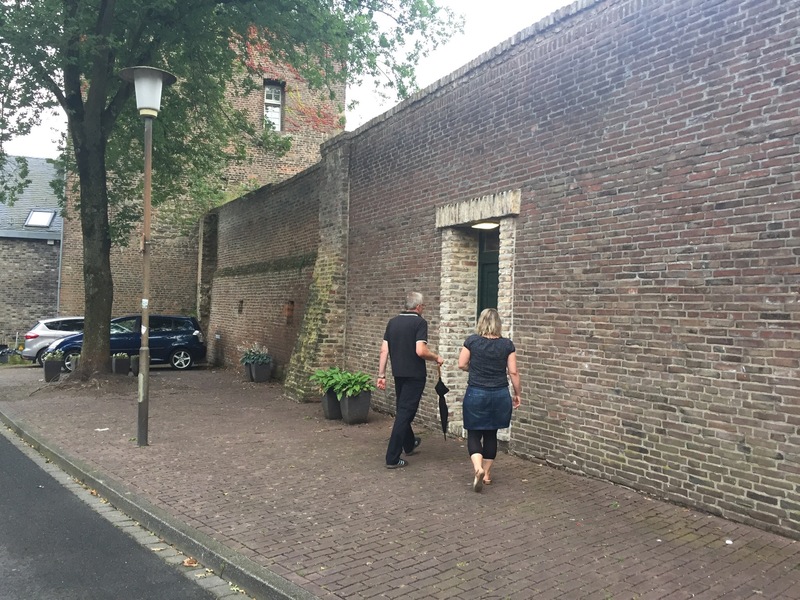 Tomorrow we are heading off (in the rain) to Nijmegen, which I have driven past many times but never visited, so I am looking forward to that! For me today’s ride was 70km at a very leisurely 15.5km per hour. 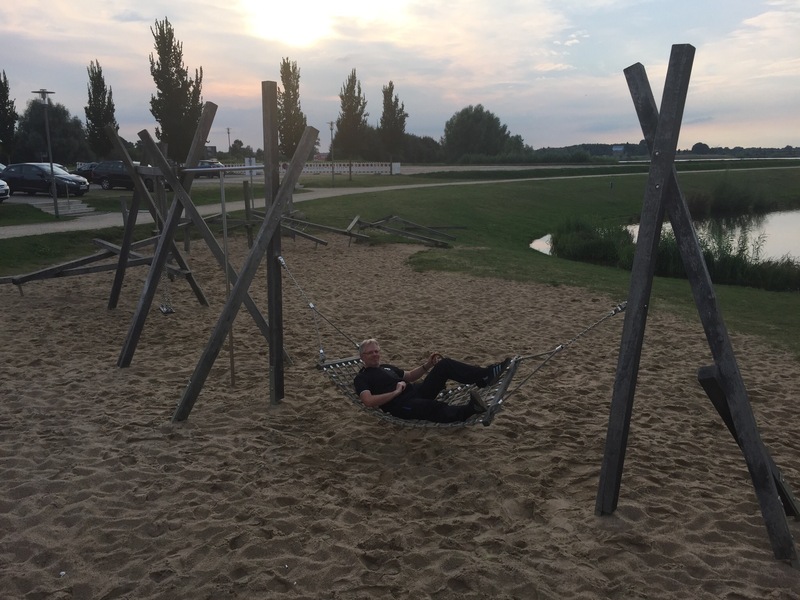 This is a relaxed tour after all!